As the weather suddenly turned BEYOND cold and plans to be this way for an extended period of time, my outdoor running days have become nonexistent. I don’t see a day above freezing for at least another 10 days and even then, it’s just a high of 32 degrees. I think I’ve lost my interest in running in temps below 25 degrees so until the mornings show a reading above 25, I will be in the gym. And I don’t see that in the forecast any time soon! With this in mind, I realize that I cannot wear out my welcome with the treadmill. I focused this week on taking things one day at a time. I got some really some good runs accomplished indoors each day while remember to mix things up by using the elliptical too. 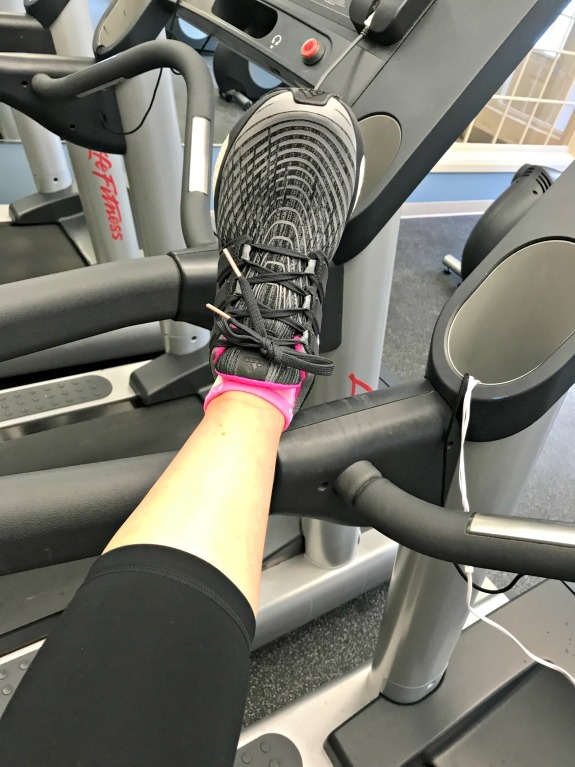 I felt grateful for the treadmill this week, rather than annoyed about the weather. It was nice to be warm indoors and most especially, I was THRILLED to be rotating my two new pairs of running shoes. The greatest thing that could have happened was replacing both pairs of my running shoes at the same time during this cold snap. I can’t begin to tell you how rejuvenating it has felt to be running, indoors no less, in new running shoes every day. If anyone needs additional winter running motivation, take a look at your running shoes. 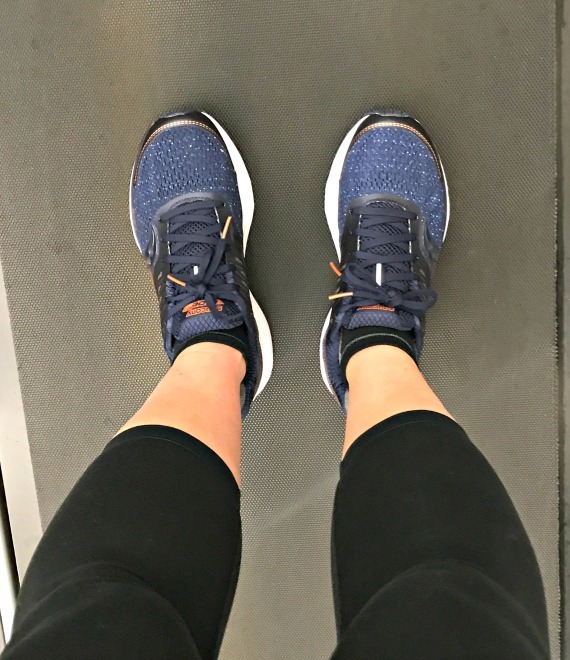 This may be the best time for replacing them while also boosting your spirits with motivation because of how good it feels to be running in new shoes! I probably could have made it outside had I waited a little longer for the cold rain to stop but I didn’t and ended up in the gym. It was fine though because I had a great treadmill run! I didn’t follow a true plan but ranged my inclines again between 1.0 – 5.0 while fluctuating the speed as well after a warm up. I chose a 30 minute lower body intensive Pure Barre workout today which I think is one of my favorites. 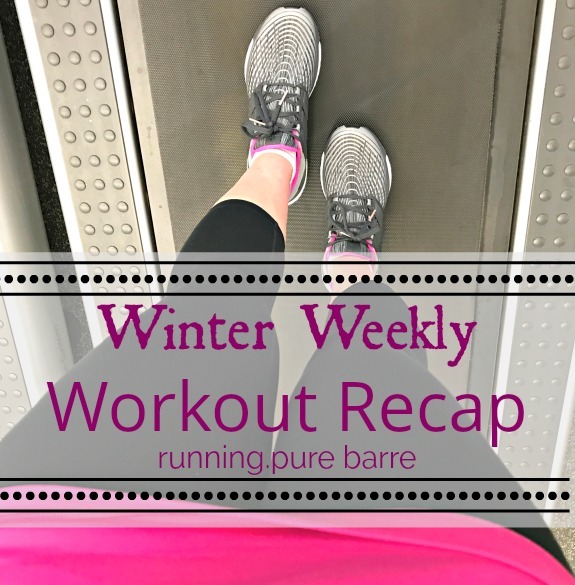 It skips the ending part of ab work but runs through the rest of the usual Pure Barre routine with an extra focus on lower body. Then I headed over to the gym with a 20 minute warm up on the elliptical followed by 2 fast miles on the treadmill. Today’s treadmill run was awesome and flew by while I played with my incline and speed. 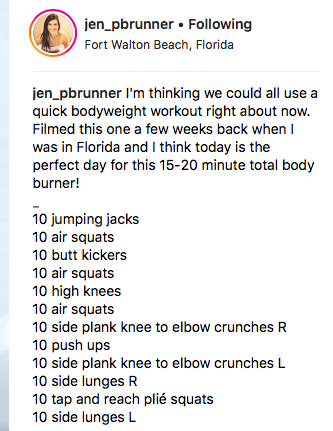 Rather than finish the hour on the treadmill to make it 7 miles, I tried Jen’s bodyweight workout that she shared on Instagram. I loved it! Well I woke up sore from yesterday’s bodyweight workout! I think that means it was a great, effective workout. With temps around 11 degrees, of course I was in the gym. I mixed things up a bit today to keep from getting too repetitive with the treadmill. Just an easy treadmill run while ranging the inclines to keep things interesting. I’m becoming a regular incline runner! I was never one to routinely run above 1.0 so right now I really feel as though I’m doing something different. I can easily handle inclines of 2.0 – 3.5 which really excites me. I combined two 5 minute Pure Barre workouts: Arms & Seat for a total of 10 minutes. The best thing that could have happened was my friend Heather called me right at mile 3 on the treadmill. I spoke to her while running easy until mile 6 which meant I only had 4 miles left! She broke up my 10 mile treadmill run so nicely! So they say tonight will be the coldest New Year’s Even here in NY in 100 years! I have no idea how those people plan to stand out in Times Square. While I was in the area of the ball dropping back in 2013, you can be sure I will NOT be out there tonight! Wishing you a very Happy New Year. Stay warm! Is it crazy cold where you live right now? What are you doing for New Year’s? How was your week in workouts? Did you have to adjust your routine because of the weather? It got cold quick here in New Jersey! I don’t know how you run long on the treadmill, I can’t do it. Good for you though! I’m staying inside today and hoping to not leave the house at all for NYE! I barely managed to run in this weather, and could not imagine standing outside at night time. I was so happy to be on the treadmill in Michigan. Now I just really wish my treadmill was here already. I am not interested in running outside in this weather any more! I TOTALLY 100% agree that it is so much more important to be grateful for a treadmill and not be ungrateful about running indoors. HAPPY NEW YEAR Meredith! It’s definitely getting super cold here too! But this year, no new years eve/ day plans and no real end of the year workouts because the flu hit hard and decided to hang around for a bit. I hope you have a great start to 2018 though! Samantha recently posted…Happy New Year! I wish it were colder here! It’s been in the 30s in the mornings but then getting almost up to 50 some days. I just want 20s as the low and good snow in the mountains. Happy New Year!